Jordan C. Walker ’08, Claudia Schreier ’08, Natalie L. Shimmel and Joanna R. Binney ’08 perform at the Rieman Center. The genres covered by the Company and directors Vivian V. Kaufman ’05 and Jordan C. Walker ’07 extend much further than the title implies, from traditional Indian dance to modern interpretations of Simon and Garfunkel. The dancers, however, provided a sense of unity in their composed poise. The similarities between each of the seven performances are as striking as their diversity. The first performance, a set of excerpts from Act II of “Giselle,” is the ultimate in classical ballet. A group of dancers play the spirits of young brides who have been betrayed before marriage, called “wilis.” To gain retribution, the wilis lead any men who venture into the forest they inhabit into a dance to the death. The dancer who plays Hilarion, one such unfortunate, really makes the character come alive in his expressive face and gestures. In contrast, the wilis’ composed, ethereal faces give them a suitably statuesque and distant feel. The precise coordination of every ballerina in the group—thanks to choreographers Rebecca J. Alaly ’05 and Morgan E. Arenson ’06 based on the original design of Jean Coralli and Jules Perrot—is absolutely seamless. Their ghostly calm makes them feel suspended, evoking the magic of the story. 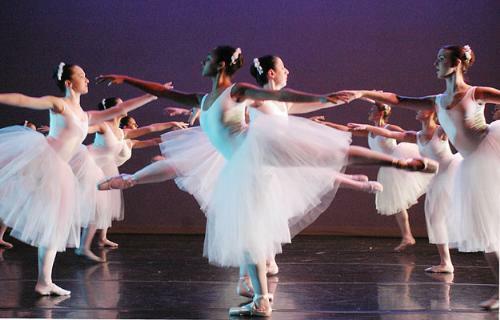 Following on the heels of “Giselle” was the more contemporary “Izzie’s Own Ocean,” choreographed by Ebonie D. Hazle ’06. This bohemian piece brings literal and stylistic color to the show. The music, a lone wailing violin, makes the performance feel exotic and elegant. The slow and smooth, almost hesitant motions of the dancers suggest a sense of searching, and as the piece ends the dancers slide into the background like the title’s ocean, receding into the distance. The next piece, “Cloud Nine,” is the most modern of the entire production. Set to Simon and Garfunkel’s “Cecelia,” the bright costumes of the dancers and strong drum rhythms mimic their playful, joyful style. The frenetic dancing reveals an impressive choreography by Kate M. Funderburk ’07; its jerky feel is intentional and mirrors the slapping and stomping of the music. Her interpretation of the music serves as a cheerful counterpart to the tragic first two pieces. “A Moment to Muse” is a return to the classical style with which “Classic N’ Country” starts, and its dancers’ swirling paces match the rippling piano music. This piece is choreographed particularly well by Nancie Woods (staged by Kate L. Penner ’07), and the way that the ballerinas group together and then break apart effortlessly is impressive to watch. The stillness of the other dancers when one takes the lead especially underscores the restful musing in the title. The fifth movement, “Water,” is a choreographic collaboration between Diana L. Limbach ’05 and MIT junior Sejal Patel. A cross between traditional Indian dance and modern ballet, the piece is striking and fun to watch; even though most of the music is in a foreign language, it’s easy to pick up on the exuberance of the performance. The dancers themselves are like droplets of water, flowing among each other as smoothly as (Hindu god) Shiva himself. The sixth piece, “Sets, Subsets, Systems,” is as organized in structure as the title implies, and choreographer Elizabeth Coker, a Columbia junior, proves deceptive in her simplicity. Three lone dancers each represent moderation, majesty, and passion in their musical forms. Molly M. Altenburg ’07 begins as Allegro Moderato—the warm colors of the lighting and her languid style emphasizes the moderation of the title. In one of the transitions whose ease marks the piece, Erin A. Straw ’07 enters as the epitome of majesty, Allegro Maestoso. Her performance is much more lively, almost frantic—but it is similar to Altenburg’s in that it seems as though she barely puts forth any effort at all. Lauren E. Chin ’08 ends the piece as Allegro Apassionato; this part is wistful and ardent, and Chin plays it with admirable minimalism. The final performance, “Nine Lives,” is a composite of three pieces by Lyle Lovett and is the source of the “country” part of the title. This movement is the culmination of the show’s blend of classical and modern. Kaufman and Walker, who staged the segment based on D. Pelzig’s interpretation, do an admirable job of making the music accessible to all members of the audience. The first piece, “She’s No Lady,” a classic country description of the problems and pleasures of married life, is playful and almost sultry; the more exaggerated movements of the dancers fit the twang and whine of the music. The second piece, “She’s Hot to Go,” is a solo by Ray W. Keller ’08. His performance epitomizes the word “exuberant” in a particularly well choreographed piece. The final act, “Memphis,” features jazzy piano and slinky ballerinas in jean skirts and bandannas. The feminine confidence and grace with which the dancers pull “Memphis” off is reminiscent of the similar group effort in “Giselle.” This striking similarity—despite the dichotomy between the two pieces—drives home the point that even when dressed down, ballet is by no means obsolete.